Windows 7 can have several users listed as computer administrator (non "Standard Users"), which will have the ability to customize not only their own profile and settings, but also have security privileges elevated enough to actually affect the accounts of other users on that computer. For this reason, you should not only avoid creating "Administrator" users unless absolutely necessary, but you should also take particular care in choosing a password to protect access to the capabilities that come with this kind of Windows account. In this tutorial, we will show you how to change the Administrator's password in Windows 7 - whether you are an Administrator yourself, or a standard user who happens to know the computer administrator's password (Windows 7 lets you change another user account's password, as long as you have the proper credentials to access it and change its settings). Follow these simple steps to choose another password for the computer's administrative account: (note that if you are the administrator and wish to change your own password, there is a simpler way - see how you can change your own user account password in Windows 7). The Control Panel will open, and have automatically the "Make changes to your user account" page loaded on screen - directly click on "Manage another account" visible further down. As soon as you do, Windows 7 will redirect you to another screen inside the Control Panel, which lists all the accounts and users currently setup on your computer. Since you can have multiple administrator user accounts, click on the one whose password you want to change. What happens next will depend on whether you are currently logged in to Windows 7 as a computer administrator, or if you are logged in as a standard user. If asked for the Administrator password, supply the current one (not the one you plan on changing to). If required to do so, enter the current administrative password for your computer; then, type inside the New password text field and the Confirm new password text field the new password you want to change to. 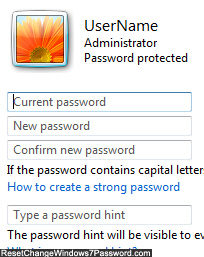 Since an administrator account is even "more important" than a regular one, you should always use the "Password Hint" security feature Windows 7 offers, which will help the administrator remember its password in case he or she forgets it. Once you have typed the current password, new password twice, and chosen an appropriate password hint for password reset options, click on the "Change password" button. This is how you change the user account password of an administrator user in Windows 7!